I take no responsibility for the fact that you are making your car less safe by removing your airbag, or in the eventuality that the airbag deploys during the removal process and blows your head clean off. Proceed at your own risk. DANGER. CAUTION. WARNING. UNSAFE. BE AFRAID. OFF-ROAD USE ONLY. DO NOT ATTEMPT. 1. Disconnect negative terminal battery and wait a few minutes. The service manual says to wait 90 seconds. This allows any charge to leave the system and prevents the airbag from accidentally deploying. 2. Remove the two torx screws from the sides of the steering wheel. Pull the airbag/horn out of the wheel so you can see the wires connecting it to the car. 3. Unhook the single black horn wire from the airbag/horn assembly. The two wires sort of side-clipped to the airbag scared me so I had the airbag assembly at arms length while i disconnected them . I used a screwdriver to slowly work them out. The airbag/horn assembly should now be free. 4. Use the 19mm socket to take off the center nut. Unclip the black wire harness (for the cc/horn/audio controls) from the spiral cable assembly. MAKE SURE THE WHEEL IS STRAIGHT AT THIS POINT. The wheel will now pull free if you wiggle it a bit while pulling. 5. The entire spiral cable assembly is just clipped in and connected to a couple of wire harnesses. To access them, remove the two phillips screws facing you on the steering column cover. You can then pull the cover apart and remove the bottom half. 6. I undid the smaller plug first since it was easy to get undone, then saved the bigger one until i had the spiral cable assembly off. Just grab it with both hands and rock it side-to-side while pulling. The three clips will undo and it will pull right off. Turn it over to get at the larger wire harness plug and undo it. 1. Reassemble the column cover and tuck the two wire harnesses out of the way. 2. Assemble the hub adapter, quick release and wheel. Use only two screws to attach the QR base to the hub adapter, as we'll be taking them back apart. Slide the complete new wheel assembly onto the hub bolt, making sure you have the wheel straight. 3. Now release the wheel with the quick release and unbolt the QR base from the hub adapter to expose the hub bolt. 4. Reinstall the 19mm hub nut, then reassemble the QR base and wheel. The End. my buddy told me how to hook the horn up, i did it the other day and it works. On the small black harness that is left behind the hub (next to the airbag harness) there is a single white wire thats the horn wire, tap the horn button (some might be different) to that wire but leave enough wire slack so that the wheel can be turned lock to lock w/o pulling on the wire (about 8-12 inches of wire). my wheel/hub/qr assembly came with a little grounding ring that was between the hub and quick release, there is 2 wire inside the hub 1 black and 1 yellow, i tapped the yellow wire to the white wire in the harness and grounded the black wire to the ring. after that step i removed the horn button off of the wheel and attached the connections on the horn to the connections on the quick release. once all the connections were made i pushed the button and voila! got the horn back. when i take my assembly off (whenever someone buys it) i'll take a couple pics. When was the last time an air bag blew anybodies head clean off? I remember one time when I was installing an air bag in one of those Mercedes land rover look alikes and it was my first time installing air bags. I was in a heated argument with a co worker at the time when I was working in that shop. We were arguing while I was working and he took a rubber mallet and kept hitting the frame near the sensor to ____ me off and I was thinking good thing the battery wasn't hooked up... While he was thumping on the bumper frame the vibrations made the ground wire jump and it touch the battery terminal and I plugged the air bag in at the same time he "accidentally" hit the sensor and the air bag blew instantly. Fired and knocked me out and I didtn think those things came out so fast. My head was like half a foot away from the bag. He got fried for costing the shop $1500 for a new bag. Other then that good write up! This should be a sticky, lots of people are swapping wheels. i've seen more people hurt by the bag than helped. the seat belt should catch u anyways. Nice write up. I am waiting on the horn button and cruise control writeups myself. 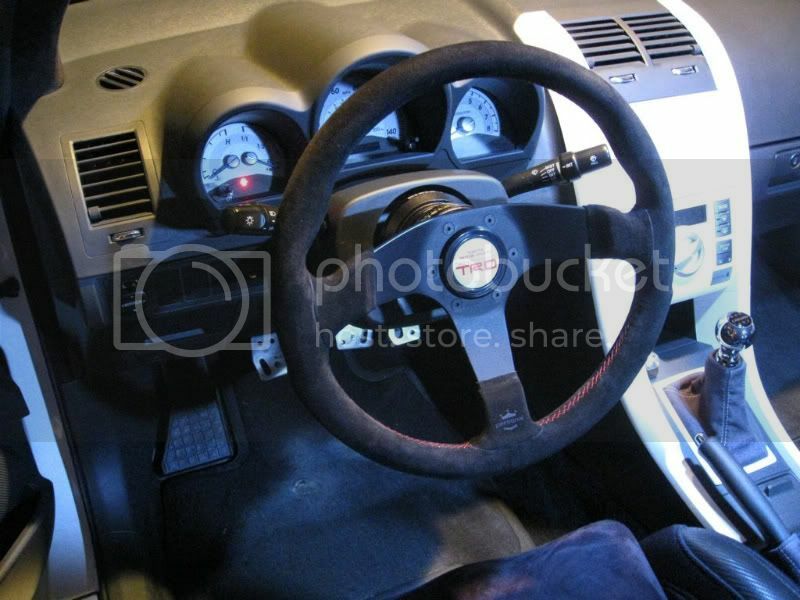 here is a photo of what ur car could look like with a new steer wheel and quick release hub. 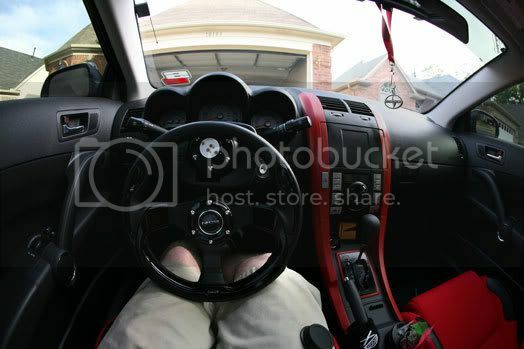 I am about to buy a wheel and a quick release, do I still need a hub adapter and if so, where do I get one for a MOMO wheel? Im thinking of getting the NRG quick release. anyone have experience with there QR's? You're right, it would probably be more of a messy tearing. I was exaggerating, but still trying to remind to people to be careful because as you make clear in your story... these things aren't a joke. You will need the hub adapter as well, yes. I have the NRG HA and NRG version 2.0 QR. The "for Toyota" HA is for Scions as well. The NRG QR will work fine with MOMO wheels. Check out weaksauceparts.com, they have HA/QR/wheel combo deals. they dont just go off from hitting the sensor. and also, airbags cost around $500 not $1500. dont believe me? look it up on Wiki. not tyring to start isht...im just sayin. 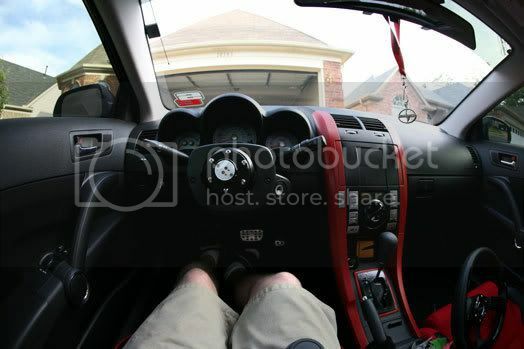 i wanted to put an aftermarket steering wheel on, but i didnt want to lose the stock wheel's audio controls. so i put the black/silver oem accessory wheels instead. winding up the cable wiring assembly was such a pain. Thanks for the write up, i just put my wheel on, took all of 30 minutes. Thanks! Thanks man, I added your info the the 1st post so it's easy to find.